The Halloween-Thanksgiving-Christmas holiday trifecta is traditionally characterized by festive and sometimes flamboyant displays of decorations. 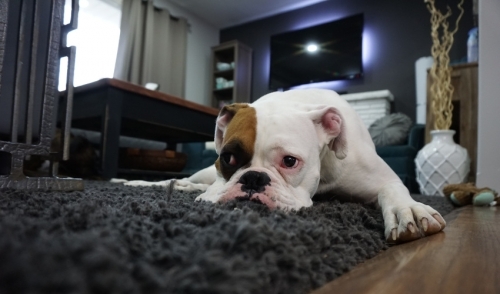 While many of these decorations are considered benign to the health and safety of you and your family, you may want to consider how they affect your pets. Dogs are the most likely culprits of gobbling up a poisonous holiday plant, so its important to take certain precautions when decorating your home for the holidays. First, beware of the poinsettia. 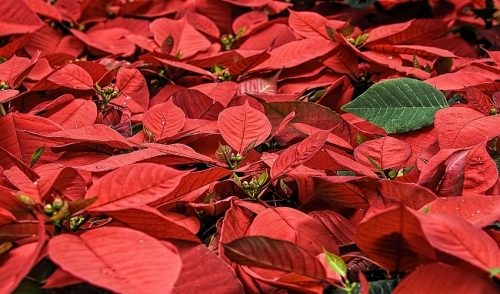 This vibrant green and red plant indigenous to Latin America is a timeless decoration in the holiday season that garnered attention in the past for its apparent toxicity. Although the toxicity is fairly mild, dogs will often suffer allergic reaction that may result in diarrhea and vomiting when consumed. The mistletoe is another plant not conventionally known to provoke gastrointestinal disturbances in your puppy. Folklore writes of romantic gestures under the mistletoe, but if your dog is curious enough to take a bite of this poisonous plant, you’ll be cleaning instead of kissing under the mistletoe. This phoradendron species has the potential to cause blurred vision, nausea, abdominal issues, blood pressure spikes, and even death in the most serious cases. Human consumption of a small amount of the plant is unlikely to result in major health issues, but a dog could face a major health emergency by eating only a few berries and leaves. In addition to the poinsettia and mistletoe, the ever-festive holly berry ought to be kept out of the reach of your dog. Interestingly, this toxic shrub had an archaic medicinal usage in relieving constipation, fever, and other ailments. The bark, leaves, berries, and seeds are, however, poisonous and has led to deaths in unassuming and hungry dogs. Holly berries carry an alkaloid similarly related to caffeine and chocolate that can have dangerous health effects when consumed by pets and small children. Lastly, beware of your dog or puppy’s curiosity with the Christmas Tree. Balsam firs, cedars, and pines invoke the festive and joyful Christmas Spirit, but they are also toxic in moderate doses. Natural oils produced from coniferous tree species can irritate the mouth and skin of your dog if bitten or gnawed. Rarely, a flame retardant or pesticide that has lingered on the tree from the time it was cut can also result in allergic reactions and associated health problems. The real danger with pets and Christmas trees is consumption of pine needles, which can puncture intestinal tracts in dogs in rare cases. While festive decorations are one of the staples of the upcoming holiday season, make sure you are careful in the placement of holiday plants amongst curious and hungry pets.